A mysterious new invention currently under development, code name 'Ginger.' Several who claimed to have seen it say that it will be a revolutionary addition to modern culture. Watch a GENUINE ;) clip of IT! Yet more background on "Ginger"
Check out Patentcafe.com for some fascinating reading and links regarding this strange phenomenon. Some believe this device is hydrogen-powered, ending the need for gasoline to get around. Click the white area to the left of the quote (BELOW) to submit your own comments. They'll show up as you visit the site. Sorry, an html bug will not allow me change text from white! so, it's kind of invisible. just look for the little white glove to show up and CLICK. Submit your IT comments here! : Click to View or Add Text. Go to http://zapatopi.net/pneumatic.html to learn more about the Personal Pneumatic Transportation System! 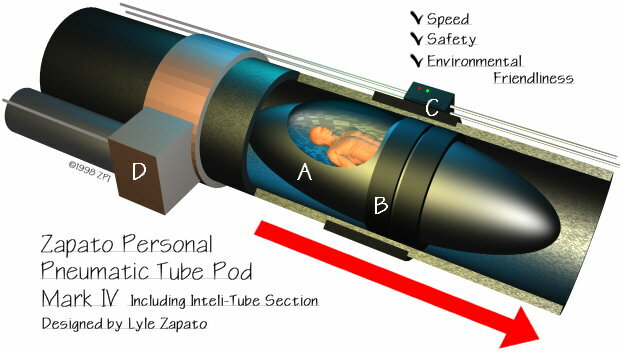 The Zapato Personal Pneumatic Tube Pod Mark IV (A) featuring: a pressurized, single-occupancy cabin; reinforced nose-cones; gyroscopic stabilization; and full on-board electronics including user-friendly navigation, communication, and entertainment systems. Tapered ends, along with centralized flange placement (B), allows for handling of tighter curves than old-fashioned tubular models. The duel-purpose flanges serve to not only create an air-tight seal for optimum pneumatic pressure, but also contain the transceiver that lets the pod communicate with the Inteli-Tube system. The Inteli-Tube detector ring and routing computer (C) reads pod navigation information and redirects it to its proper destination. The air-pressure regulation ring (D) controls pod velocity and direction.